Can you identify the man and woman in this photograph? A black and white large format negative of an unidentified man and woman. It appears that they are preparing to cut into a wedding cake. 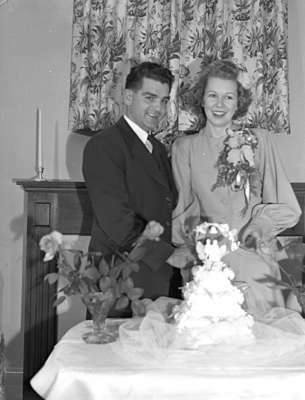 Unidentified Man and Woman (Image 2 of 2), Marjorie Ruddy. Whitby Archives Photograph A2013_040_1156. Scanned for a black and white large format negative.